No way is she 81. 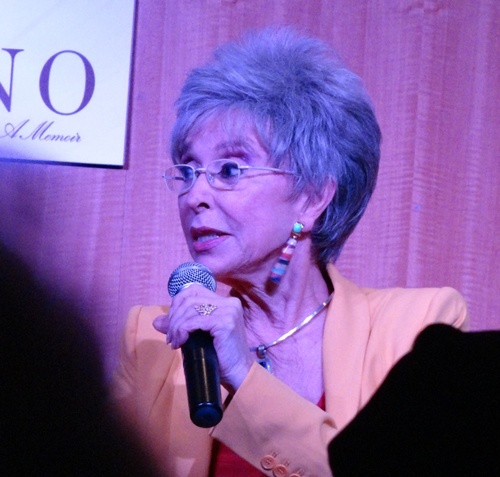 That’s the first thing I thought as Rita Moreno sprang onto the little stage at the 86th street Barnes and Noble tonight, petite and wiry. She’s more bright-eyed and alert than I think I ever was on any given day in my 20s. She can’t possibly be 81. But then, you can’t deny the mathematics of it all. West Side Story, the film for which she will most be remembered, forever and ever, released in 1961, and she was 30 as she swirled and stamped across that rooftop to debate with George Chakiris the pros and cons of life in los EE UU when you’re a native of Puerto Rico. Today marks the release of Rita Moreno’s memoir, a chatty, conversational look back at her rich life and the varied, wide-ranging career that led to Tony, Emmy, Grammy and Academy awards, and where else could she be for that launch but aamchi Nueva York, the city where she and her mother settled, first in the Bronx and then in Washington Heights. And to discuss the book, who should accompany her but Lin-Manuel Miranda, the Tony award-winning composer, author and star of In the Heights, who also worked with Stephen Sondheim to translate lyrics and dialogue of West Side Story into Spanish when the show returned to Broadway a few years back. If you can get to any of Ms. Moreno’s public appearances on this book tour (this Thursday, March 7th, she’ll be out at the wonderful Cinema Arts Center in Huntington, Long Island to attend a screening of West Side Story and a reception afterward, and a week later, on March 14th, she’ll be doing a book signing at the Barnes & Noble at The Grove in Los Angeles), do it and be there early, because the crowds will be big (we had to have wristbands tonight in order to be admitted – you’d think it was a queue for U2 tickets). On stage, she was like Maeve Binchy’s long lost Boricua cousin. You just ask her a question and get out of the way. She’ll answer in detail, including all sorts of illustrative asides and commentary, in her warm, bright manner. This is clearly a woman who – as she mentioned tonight, though she never finished high school – as she grew and progressed through her career, must have had the curiosity and desire to never stop learning. To listen to her, you would assume not only had she been to university, but had most likely also taught there as well. When two questions from the audience tonight touched on Latina actresses and their status in the film industry, Moreno had an observation and an admonition. First, she commented “The door is ajar, but it’s not all the way open yet.” But she noted that – unlike in her younger days, when playing any Latina character meant she always had to have an accent – Jennifer Lopez can now perform in a film and have no accent. (Which brought to mind an Aasif Mandvi interview on WNYC last week.) And second, she stressed the importance of a good education as a necessary foundation for any actriz-in-the-making. At somewhere around age 8, NBC runs West Side Story on TV. I’m transfixed and enraptured by it, but especially by Rita in the role as the strong, spirited and incredibly sultry Anita. Watching her dance the way she did, in that divine mauve dress with the crinolines and the fringe and the matching pointy-toed high heels, I wanted to fall into the TV and become her, and be the one dancing at the gym and flirting on the roof with the equally stunning Bernardo. But, seeing that it’s getting late, my mother orders me to bed before the film is over, and I proceed to have the biggest meltdown and crying jag in my life. It was epic. Unable to budge my mother, I fling myself onto my bed, but before I fall asleep, worn out from all the crying, the cement is set. The film and those characters have imprinted on me with such permanence, even if I’m not aware of how, until years later. I do finally get to see the whole film when it runs on TV again a year later, and bawl my eyes out once more, except this time it’s because of the story. My obsession grows and deepens when I’m given a cassette of the movie soundtrack, which I listen to, over and over and over on my summer vacation, perched in the small apple tree in my grandfather’s garden in Dublin, clutching a little Grundig cassette player, blaring the music at full volume until the poor neighbors appear at the hedge and ask me to please turn that down. After a four-year, long-distance romance fed on up to three letters a day and twice yearly visits, I head off to college and am swept up by life in Manhattan, and the romance ends. Now fluent like a native (Mexican) speaker, I end up choosing a major of Spanish and Latin American literature. Then I go to graduate school in Spain, then return to New York and begin work at my first serious full-time job. Years later, in 1997, still in love with musicals and now also deeply curious about India, I go on a whim one Saturday night to see my first Hindi movie ever – Pardes, starring Shah Rukh Khan. There’s no Anita and Bernardo, but there is lots of music and dance and a love story (albeit a rather twisted one). I quickly learn that – while the musical has long since died out in Hollywood – it’s been thriving for decades in Bombay, and Madras, and a new obsession begins. Nine years and many Hindi movies later, I meet my first screenwriter for an interview, and my own writing gets a nudge forward. So, if I’d never seen Rita Moreno in West Side Story, who knows where I’d be instead. Gracias, Madrina, te agradezco de sobremanera.